Well, this is one season no one will want to revisit anytime soon. 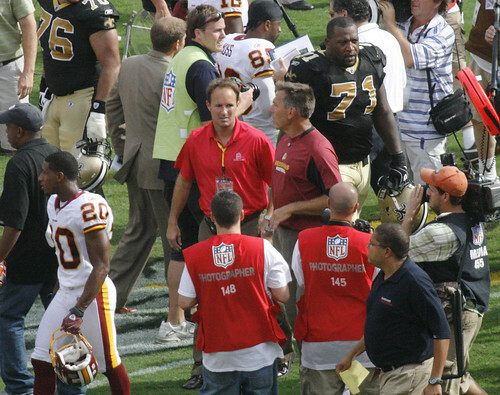 This morning, Jim Zorn was fired (my only surprise was that he rode their plane home), after the Skins put up their worst record since they went 3-13 in the 1994 season. Zorn finishes his tenure with the Redskins at a tremendous 12 and 20 (.375), or, just where Steve Spurrier finished in 2003. He is the sixth coach of the Skins to be fired since Dan Snyder bought the team in 1999, none of whom have an over-.500 record. There’s little to celebrate at the end of the season. Jason Campbell still isn’t the Quarterback-leader the Skins are hoping for. Chris Cooley is on the mend, this is true, and he’ll be a bright light for 2010/2011, but there’s a lot of rebuilding left t go. But if the Skins were to do one thing this off-season to engender trust from their fans? Take Dan Snyder away from the reigns of the team. Entirely. Hire Shanahan and then take two years away from the team, Danny boy, and maybe then you’ll be alright. “I’m a Goofball,” says Gilbert Arenas the other night, following the fourth straight Wizards loss, when asked about the firearms in his locker. This one has the potential to be a big story worth watching, as there’s likely to be both criminal charges and league consequences. The biggest possible outcome for the Wizards here, though, is that they might be free of Arenas’ $110M contract if he’s found guilty of a crime, or if the league passes down an immense suspension. As much as Arenas likes to joke about the situation, and his Twitter this weekend was just that: a joke, this is a pretty serious time for him and the Wizards both. The Wizards have won just 10 games this season so far, and haven’t won a game since before Christmas, and at this point, you have to feel for Flip Saunders who can see a club that has the talent to get better, but has nothing but distractions on- and off-court. Look for a detailed half-season review from Ben Rome later this week. The Caps are on a bit of a slide at the moment, having lost three in a row, and the weakness at goalie is definitely a problem. But better yet, how about the Caps in the Winter Classic next year? ESPN says very possibly the Caps might head up to Pittsburgh for an outdoor matchup in Pittsburgh. Me? I can’t get excited about a game in Pittsburgh. But what whets my appetite? Temporary rink on the Mall. I know, right? Goosebumps. I dunno, PNC Park needs to have some sort of winning team play in it – so why not two? And the vista from there? Gorgeous. With the Classic slipping to a bidding process (a la the Super Bowl), I suspect we’ll probably see a New York or [insert any Canadian team city here] venue for 2011. If here, it’d have to be Nats Stadium or RFK, as the Mall just couldn’t handle it. I know that I would be trying to get tickets if it was in DC, maybe even if it was in Pittsburgh or Philly.